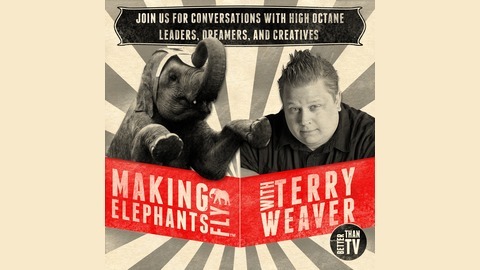 Making Elephants Fly features conversations with High-Octane Leaders, Dreamers, & Creatives hosted by Terry Weaver. Terry is a speaker, author, and ideapreneur who has invested his life in others to giving them the tools to live life alive; whether through helping others see their dreams become reality, traveling around the world challenging young leaders to change the world, leading teams of people to do more together than they could alone, or hanging out with Mickey Mouse. Over the last 20 years, Terry has spoken to hundreds of thousands of young leaders, worked with entrepreneurs to take their idea from a thought around the fire to a six-figure business, and partnered with creatives to expand their platform from their garage to the stage of the Grammy Awards. On some episodes, we will be sitting down with a New York Times Best-Selling Author, a Disney Imagineer, creative leaders from organizations like Cirque du Soleil, an incredibly successful business leader, or sometimes an entrepreneur just getting started and trying to get their dreams off the ground. Above anything, our greatest desire is to help you discover your passion, unleash your purpose, and start doing the work that you have been created for. Our hope is that it feels like you are pulling up another chair to the table with us and grabbing a cup of coffee and listing in on the conversation. 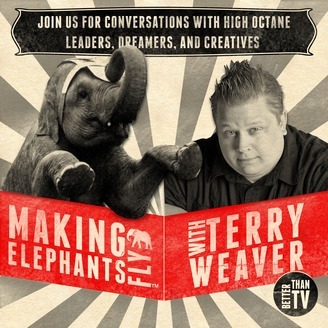 On this episode of Making Elephants Fly, Terry sits down with Rob Lott. Rob is a Disney Cast Member, actor, Speaker, Host of the Leading Creative Podcast, an avid reader, and one of the key leaders in Orlando's creative and theater community. Rob has been a professional performer and director for almost twenty years. He and his teams have created intimate atmosphere shows as well as spectacle stage productions for large audiences. His passion lies at the intersection of Leadership and Creativity. We learn how leadership is just a job, it's an art form and how you can lead creative regardless of your role in the show. We talk about the Circus, why Rob has so many job's and Disney and beyond, his role as Sixbits Slocum in the Hoop De Doo Musical review, and as one of the iconic Dapper Dans on Main Street USA. Stay tuned to the end when we talk about how to get a job at Walt Disney World. Together we will discover why safety is the enemy of us seeking our most creative work. Use the code PODCAST to join Rob and Terry at The Thing 2019 in Orlando. Find out more at http://terryweaver.com and http://thething.live .